Space science might never get off the ground without the flight dynamics experts who work with scientists to execute their vision. The SSL flight dynamics team is small, highly collaborative, and tightly integrated with other departments. They consult on mission design and proposal development, calculating the energy costs of hoped-for maneuvers and helping figure out how to scope a mission in order to make it viable. Once an SSL-operated spacecraft has launched, the flight dynamics team handles maneuver planning and execution, as well as orbit and attitude determination. This is no simple task if spacecraft are in orbit beyond the sphere of GPS satellites. In these cases, our flight dynamics team uses the ground station to figure out the distance to the spacecraft at a given moment and calculate the Doppler shift on the frequency of the transmission, running the data through dynamic modeling to determine position and velocity. In addition, they are prepared to respond quickly to any collision assessment events. The greatest achievement of our flight dynamics team has been the operation of the five-spacecraft constellation known as THEMIS and ARTEMIS. All of the day-to-day operations have been handled out of the Mission Operations Center here at SSL since the mission launched in 2007. To date, our team has executed more than 750 separate maneuvers on these spacecraft. 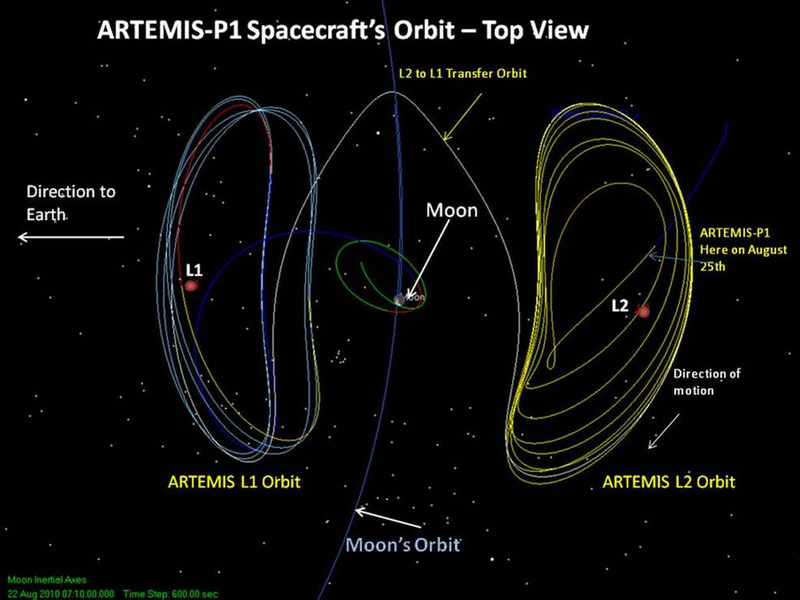 The two ARTEMIS spacecraft were the first ever to orbit around the Earth-Moon L1 and L2 Lagrangian points, areas where—with the help of constant adjustments by the flight dynamics team—a spacecraft can maintain its position in a dynamic equilibrium with the Earth-Moon system. No one else has gone to that region of space. After that pioneering spaceflight, the team maneuvered the ARTEMIS spacecraft into lunar orbits, one prograde and one retrograde, which they still maintain today, at times approaching as close as 10 kilometers above the lunar surface.